Tracking Superbug Infections – microBEnet: the microbiology of the Built Environment network. I just read an interesting article where superbug infections were tracked across Europe. Isolates had their whole genome sequenced and then the resulting visualizations were put online for people to see (you can also upload your own data to the site). Not only is this a really useful tool in terms of observing the spread of superbugs, it might help us curb the spread of superbugs by finding their sources. 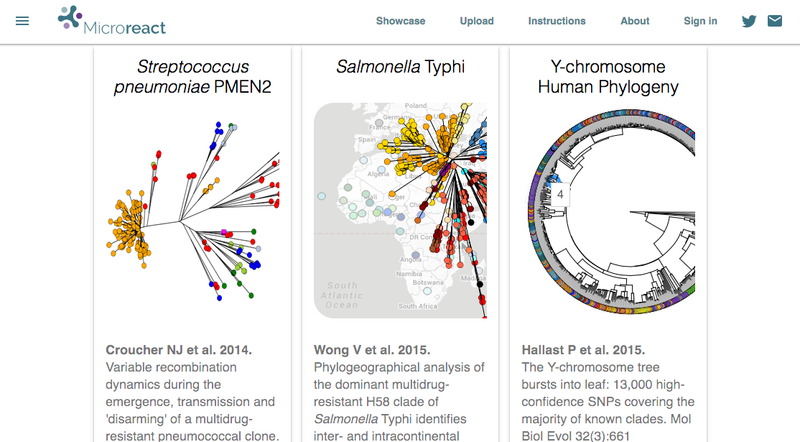 I also find myself wanting a website like this for microbiome work. It looks like Qiita is trying to accomplish this, but I haven’t used it yet myself. Definitely cool and useful to have access to a ton of sequence data and visualize it all on a website, particularly with the goal of tracking superbugs. Screen Shot of Microreact website.